Coed y Brenin Visitor Centre at Coed y Brenin Visitor Centre (NRW)01341 440747work Visitor CentreCoed y Brenin visitor centre is the gateway to Coed y Brenin Forest Park. Try world-class mountain bike trails, family walks, café, cycle shop, all-ability play area and an easy access trail. The Cafe uses the best locally produced and healthy food with bread and cakes from local bakers or from the cafe's own kitchen. Meat is supplied using local suppliers and venison burgers come from within Coed y Brenin Forest itself. The Visitor Centre is the starting point for 8 mountain bike trails including MinorTaur (9km), Tarw Du (20.2km), Beast (35km) and other technical trails. Y Ffowndri, a skills area, is also present on site. All trails are waymarked. There are 4 way-marked walk trails ranging from 1 to 5 miles, and 5 waymarked running trails ranging from 1 mile to 13.5 miles 'half marathon'. 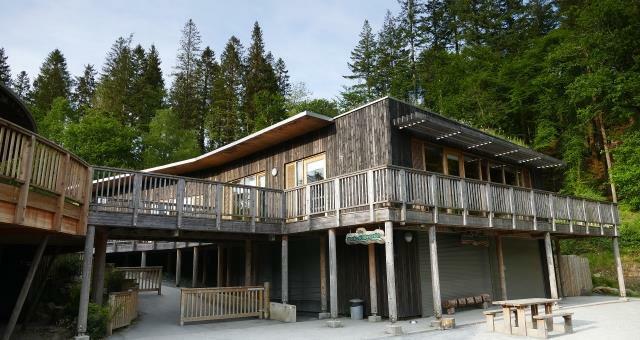 Coed y Brenin visitor centre is the gateway to Coed y Brenin Forest Park. Try world-class mountain bike trails, family walks, café, cycle shop, all-ability play area and an easy access trail. Audio trails are available so download onto your mobile phone and take with you when you walk around this beautiful forest area. The Visitor Centre and Cafe are open 7 days per week, throughout the year (except Christmas Day, Boxing Day and New Year's Day). Summer opening times (1 April - 30 September): Monday to Sunday 9.00am to 5.00pm. Autumn opening times (1 October - 4 November): Monday to Friday 9.00am to 4.30pm, Saturday and Sunday 9.00am to 5.00pm. Winter opening times (5 November - 31 March) Monday to Sunday 9.30am to 4.30pm. Free for the first 20 minutes, £2 for 2 hours, 40p for every additional 20 minutes. Maximum charge is £7 per day; overnight parking is not permitted. You can buy a season ticket for £40 to cover car parking charges for 12 months from the visitor centre reception.